If we tend to work with many folders and files simultaneously, it is possible that on some occasion we will have accidentally deleted a file that may have been important for the future, regretting the lose of that important data. 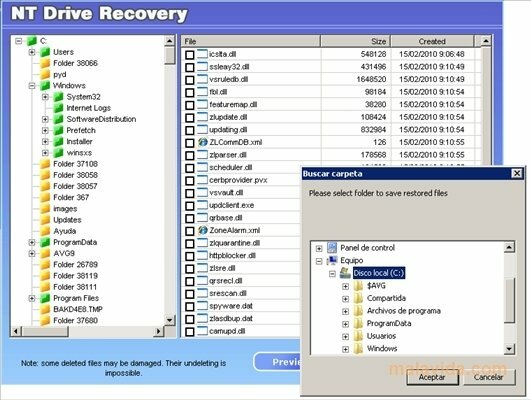 This should no longer be any problem for any user, because we can now resort to NT Drive Recovery, a very easy to use application that will allow us to recover those files that have accidentally been eliminated from the system, and that we want to recover. Once the program is installed, we will only have to launch a disc analysis, thanks to which the application will find those folders and files that have been eliminated from the drive. After that, it will show us a list with the deleted file, allowing us to choose which ones we want to recover and in which folder we want to place them. If you already know how bothersome it can be to accidentally delete an important file and you want to have the possibility to recover any files deleted in this way in the future, try NT Drive Recovery.